The MAX7301 compact, serial-interfaced I/O expander (or general-purpose I/O (GPIO) peripheral) provides Microprocessors with up to 28 ports. Each port is individually user configurable to either a Logic input or Logic output. The MAX7301AAX and MAX7301ATL have 28 ports and are available in 36-pin SSOP and 40-pin TQFN packages, respectively. The MAX7301AAI has 20 ports and is available in a 28-pin SSOP package. For a 2-wire IC-interfaced version, refer to the MAX7300 data sheet. For a pin-compatible port expander with additional 24mA constant-current LED drive capability, refer to the MAX6957 data sheet. 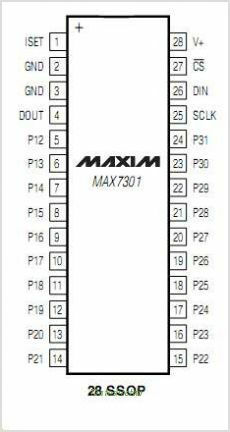 This is one package pinout of MAX7301,If you need more pinouts please download MAX7301's pdf datasheet. 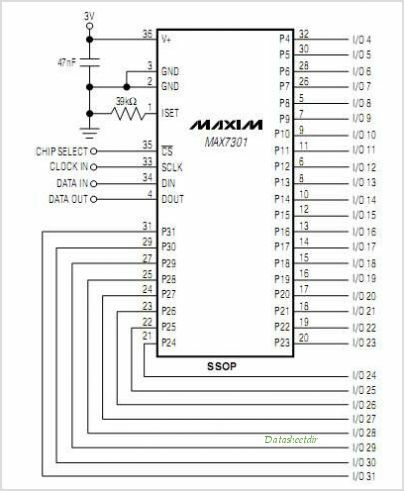 This is one application circuit of MAX7301,If you need more circuits,please download MAX7301's pdf datasheet.